Q: Can you tell me the difference between a target and a link. 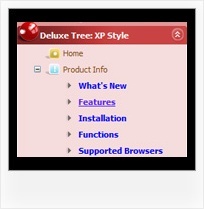 Q: Hello I am trying out deluxe menus. Fantastic piece of software - however the test menu I have created only works fine when I upload to an area outside the restricted area (i.e members area) of my server. Inside this area and it does not appear. Is that becuse I am using the trial version? No, it is not the reason. Trial version has full functionality. Please, send us a direct link to your website, so we can check it. eMenuTree: Build Tree Instructions for using the build tree tab in eMenuTree. When inserting HTML code into a tree menu, you will usually want to check the "Hide the page link image" check box.